Soulaima Gourani occurs from time to time on television, radio, web and in print. 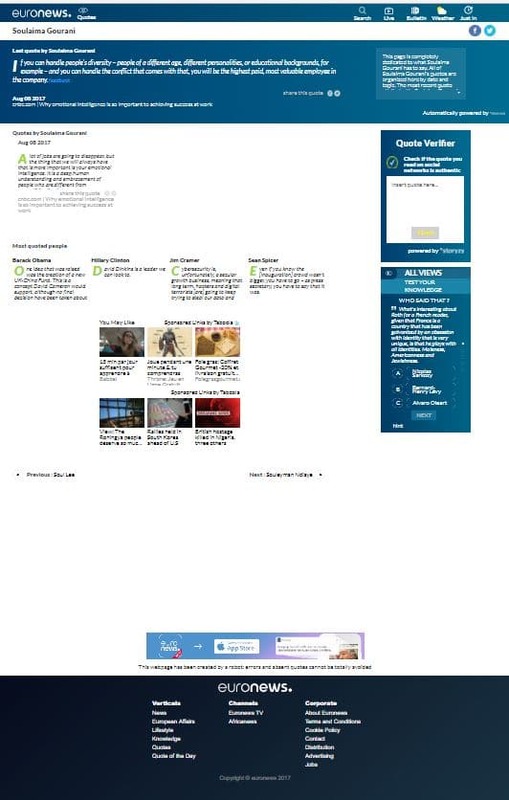 On this page you can find a selection of articles / publications written by or concerning Soulaima Gourani. Does your media want a comment or an interview, please call or write. 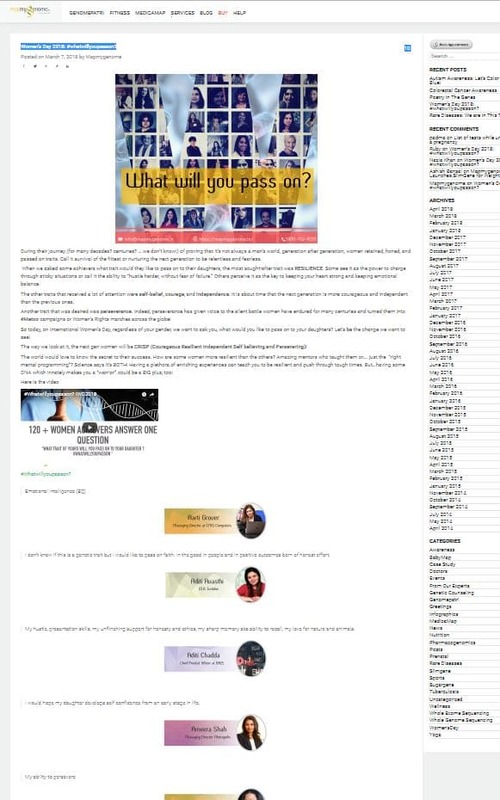 For longer articles written on request please contact Soulaima for an individual agreement. 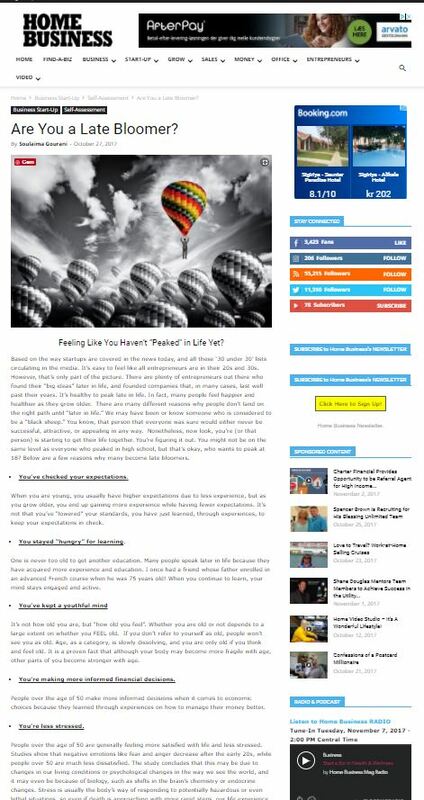 You can click on each of the articles below to display them online or as a PDF or Issuu format. Senator Elizabeth Warren announced that she was exploring a 2020 presidential bid. 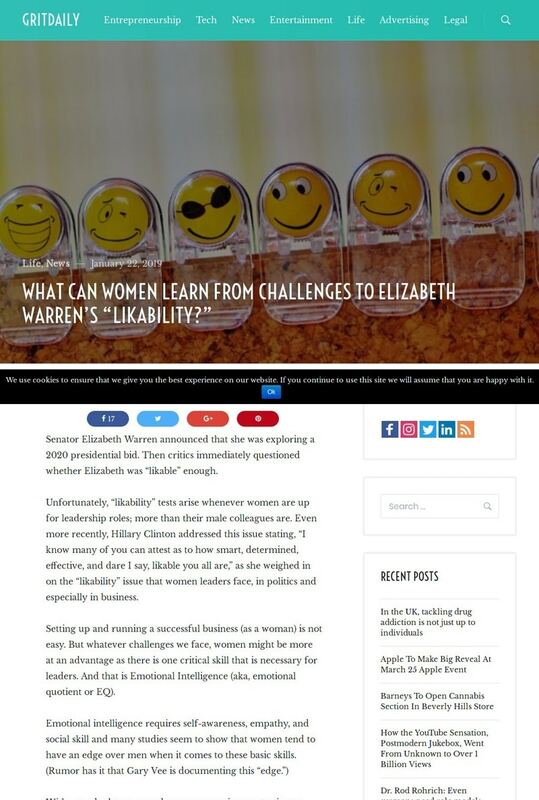 Then critics immediately questioned whether Elizabeth was “likable” enough. In order to raise your market value and live the life you deserve your true talents should be found, practiced, and continuously evaluated. I always say, one way to find your “true talents,” is to find your purpose in life. Do you fell you haven’t peaked in life yet? No worries, it is perfectly healthy and normal. Many people feel happier when they grow older and more prone to make decisions that fit the kind of life they wish to have. 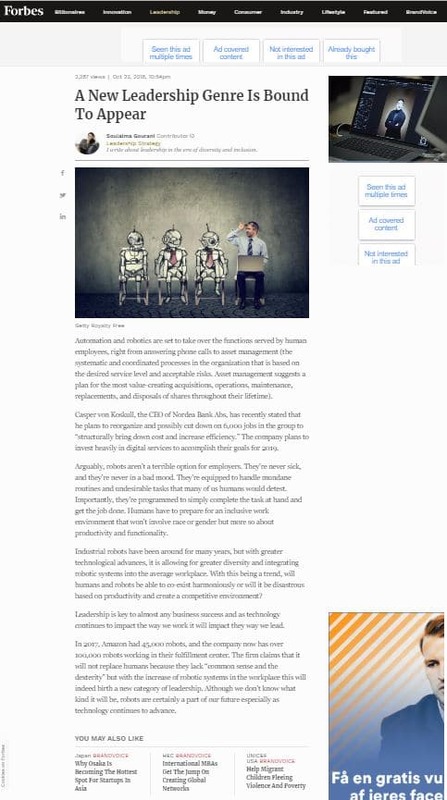 Automation and robotics are set to take over the functions served by human employees. Leadership is key to almost any business success and as technology continues to impact the way we work it will impact they way we lead. The vast majority of innovative people and companies I’m personally familiar with became innovative because they didn’t have time, money or were excluded and unappreciated. Would you like to receive help again and again? 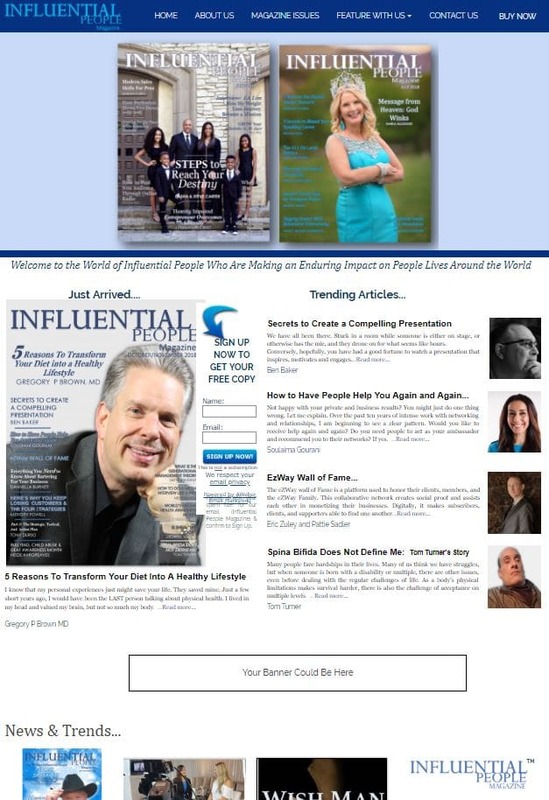 Do you need people to act as your ambassador and recommend you to their networks? When asked how companies can help develop EQ skills in their workforce, Gourani reminds us that it’s up to the individual to take these steps. Where should you start? She suggests three areas for growth. Implicit bias is alive and well in the workplace. Soulaima Gourani was one of 6 women who faced it, and in some cases changed it for the women who came after them. 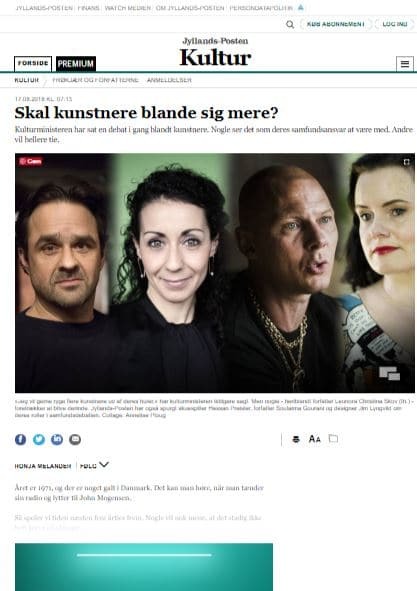 The Danish minister of culture has launched a debate among artists. Some see it as their social responsibility to participate in the public debate. Others would rather stay quiet. (Danish). This new era requires new ways to work, think and live. Latest research shows that people who are bored and not motivated in life may die younger than those who do something they like and feel passionate about. 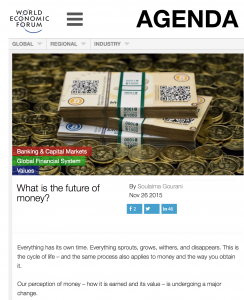 Soulaima Gourani shares her insights about the future of work. According to her, emotional intelligence will become the most powerful asset in professional settings. Sometimes when those close to us reach success in their careers or personal life, we start to get jealous and wonder why weren’t as fortunate. Some people have fundamental difficulties with handling success—in particular, the success of others. “Solopreneur” isn’t a “new” term but it has become a lot more relevant recently. The word can easily be interchanged with the word “entrepreneur.” However, there are distinct differences. These new times require new ways to work, think and live. The latest research shows that people who are bored or who don’t really care about what they’re doing may die younger than those who do something they like. 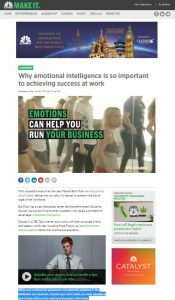 Emotional intelligence (EQ) is the most powerful predictor for professional success, even more than intelligence and personality, says Soulaima Gourani. 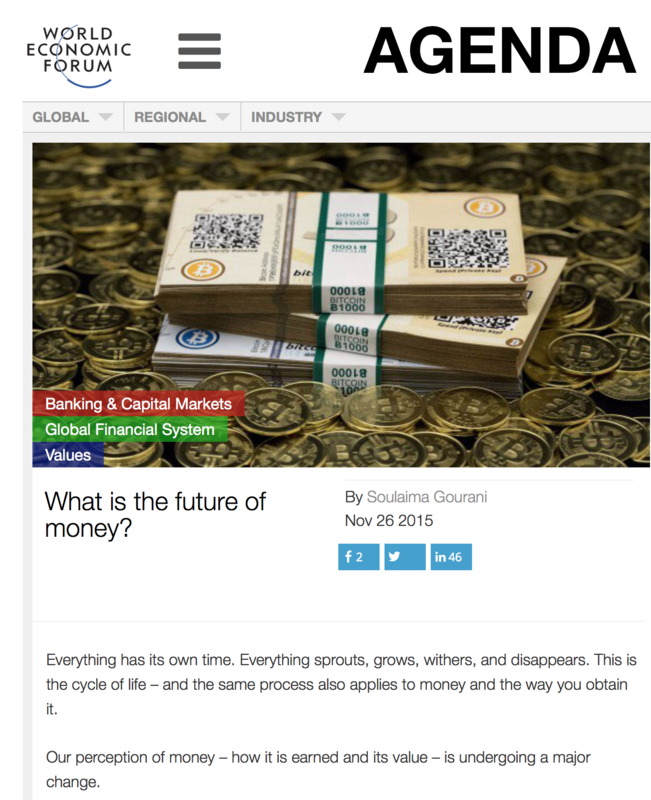 Soulaima Gourani shares her insights about the future of work and what skills will be needed. To be successful in a partnership you need to understand the human agenda and primitive drivers of all parties. When you combine this with the organizational approach to the business, you’re much better equipped to understand the reasons behind its success or failure. When we asked some achievers what trait would they like to pass on to their daughters, the most sought-after trait was RESILIENCE. Some see it as the power to charge through sticky situations or call it the ability to “hustle harder, without fear of failure.” Others perceive it as the key to keeping your heart strong and keeping emotional balance. 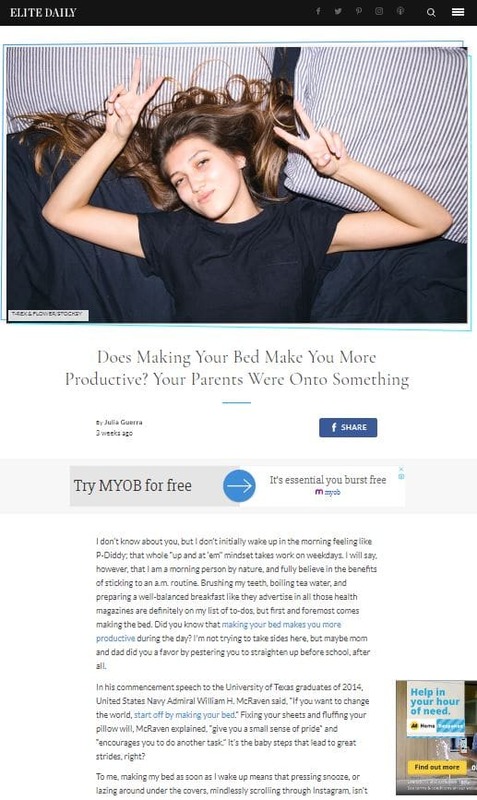 “Not making your bed,” Soulaima tells Elite Daily, “will give you a feeling of having a loose end,” so by taking a few minutes to straighten out your sleep space, you’ll ultimately “eliminate stress” that, when you think about it, is 100 percent self-inflicted and unnecessary. To be competent in the future, it is not your education, business skills, or expertise that makes you valuable at work. What you need to develop are soft-skills, such as empathy, ability to work with others, and integrity. Women in business are on the rise. 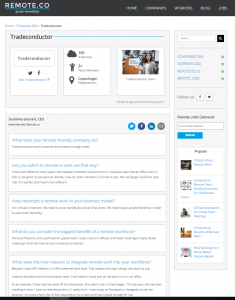 We asked Soulaima about her story, how she started her business and the future of TradeConductor. One of the most powerful business leaders today, Elon Musk, believes that robots represent the future workforce and technology will replace a lot of jobs. Soulaima Gourani shares her insights about what will be your most valuable skill at work in that environment. Executive Editor, Edie Lush, talks with Soulima Gourani, Speaker and Author about the origin of Global Dignity and their work. Setting up and running a successful business is not easy. There are two traits that are required in order to achieve success; effort and determination. Great leadership is another major factor. Jealousy is a normal emotion that everyone experiences, but if you’re not careful, however, jealousy can grow into resentment and bitterness. Read more about how to deal with jealousy in friendships. The recipe for becoming memorable is relatively straightforward. Many of us can increase our rate of memorability by training our ”likeability.” When you meet someone for the first time, it is essential that you spend the first couple of minutes wisely. Who knows a woman who fights for her place in this world? I know quite a few. Soulaima Gourani is among them. 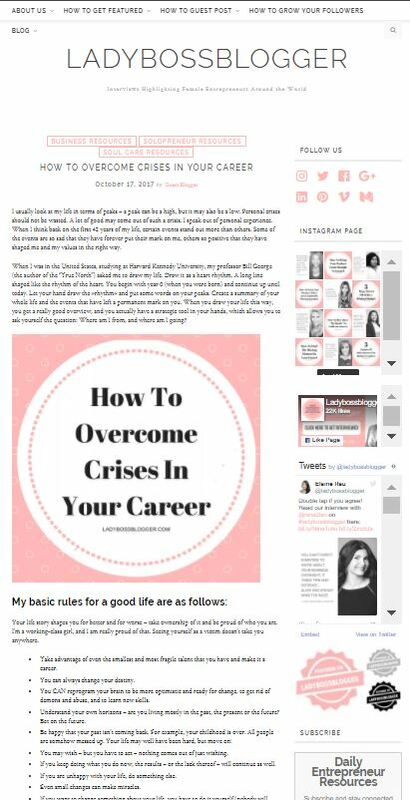 Her book “Take Control of Your Career” could help and encourage you. 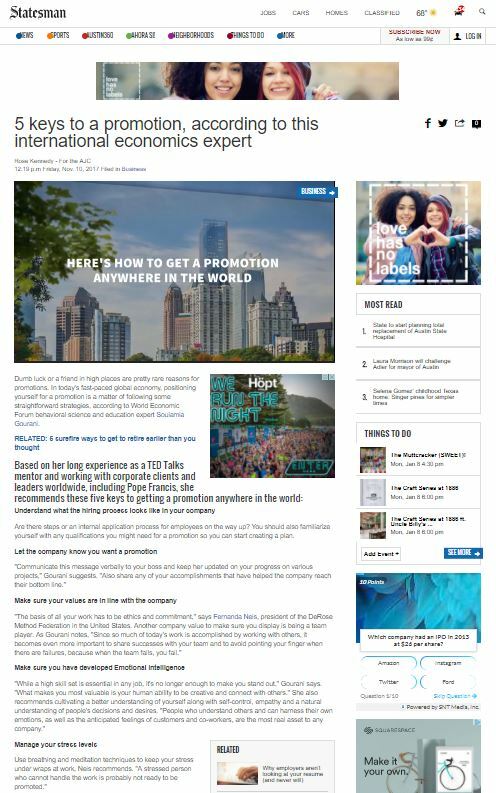 Dumb luck or a friend in high places are pretty rare reasons for promotions. 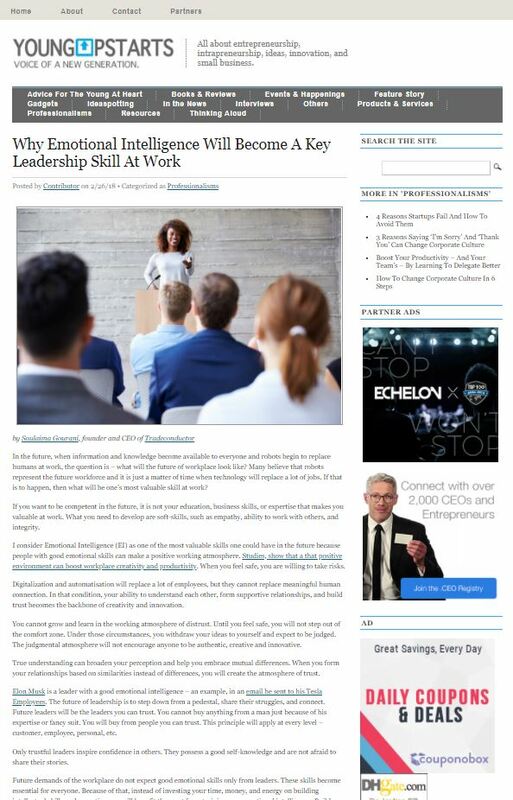 In today’s fast-paced global economy, positioning yourself for a promotion is a matter of following some straightforward strategies. 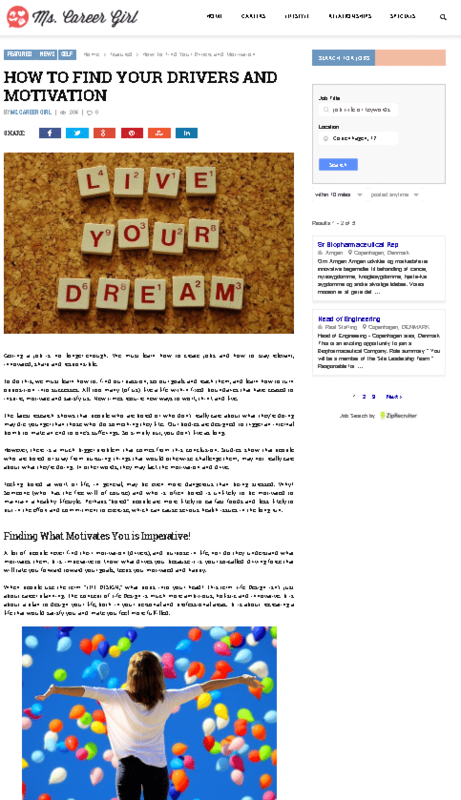 Guest blogger: “Young Upstarts”, youngupstarts.com. 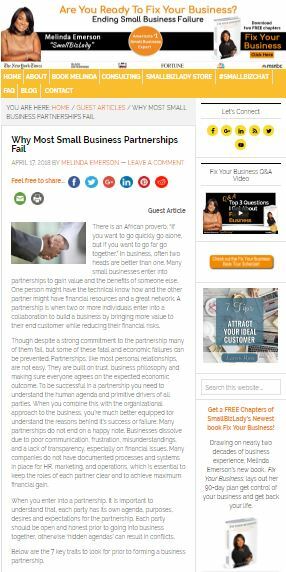 Are you or your company going into strategic partnerships with other people or companies? 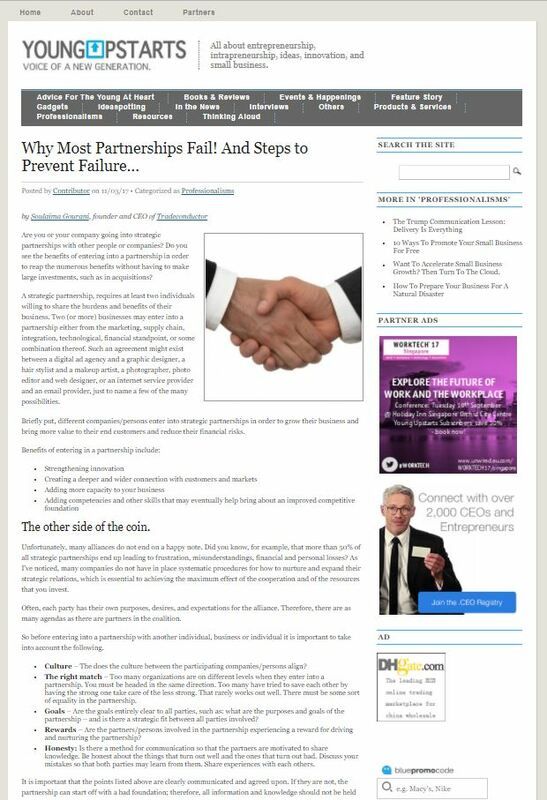 Do you see the benefits of entering into a partnership in order to reap the numerous benefits without having to make large investments, such as in acquisitions? 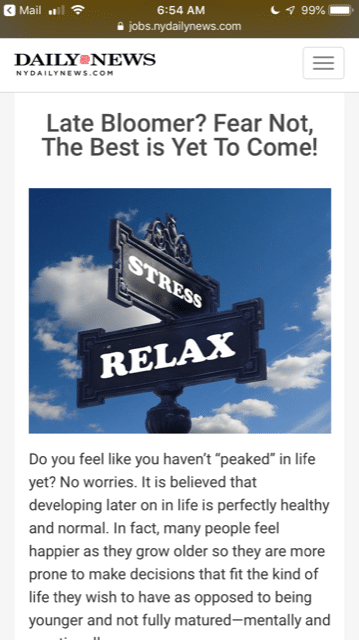 Guest blogger: “Home Business”, homebusiness.com. Feeling Like You Haven’t “Peaked” in Life Yet? It’s easy to feel like all entrepreneurs are in their 20s and 30s. However, that’s only part of the picture. There are plenty of entrepreneurs out there who found their “big ideas” later in life, and founded companies that, in many cases, last well past their years. 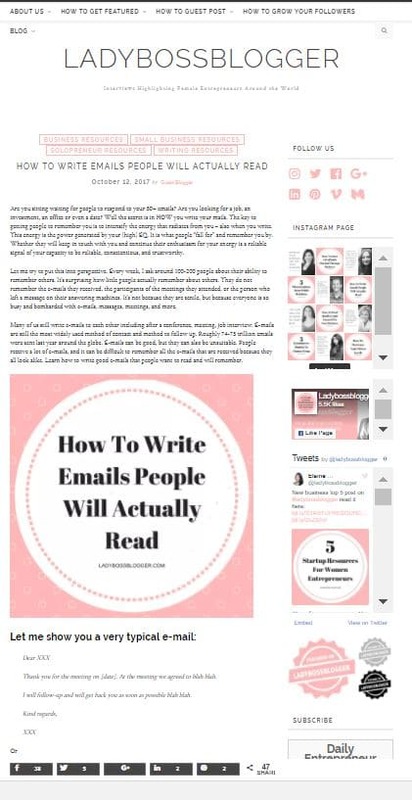 Guest blogger: “Lady Boss Blogger”, ladybossblogger.com. ‘A personal crisis should never be wasted – a lot of good may come out of such a crisis. Your life story shapes you for better and for worse – take ownership of it and be proud of who you are’, says Soulaima. She also shares her own basic rules sfor a good life. 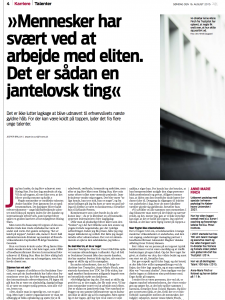 Interview: “Berlingske Business Magasin”, business.dk. Are you looking for a job, an investment, an office or even a date? Well the secret is in HOW you write your mails. The key to getting people to remember you is to intensify the energy that radiates from you – also when you write. Too many still believe that leaders with mental health problems can’t (or shouldn’t) hold a job or office. 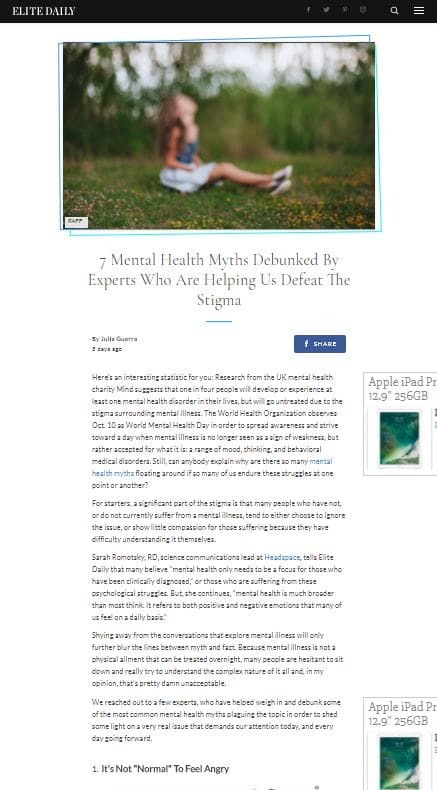 This is not the truth at all; it is a myth that leaders are superior (resistant) to mental health issues. According to motivational speaker and philanthropist Soulaima Gourani, having a “live” sense of energy is important when it comes to developing self-confidence. Positive energy is a mindset. 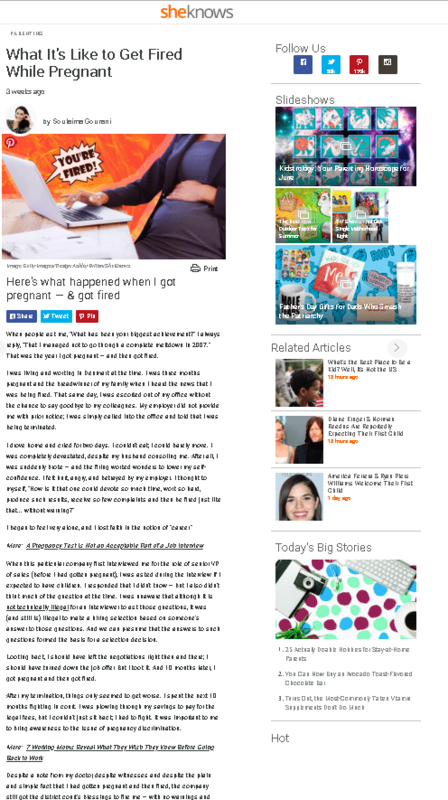 Interview: “Lady Boss Blogger”, ladybossblogger.com. ‘Currently, I dedicate my life to improving the lives of others. I make people and companies brave, shine and bold by helping them unleash their enormous potential and find their real talents, purpose, and passions’. To be forgotten by people can cost you your confidence. So, what’s the secret to being memorable? The recipe is straightforward. By training our likability we can make a greater impression on people. When you meet someone spend the first couple of minutes wisely. 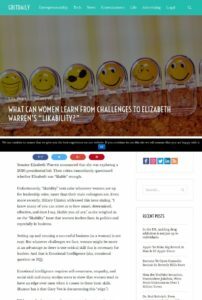 According to Stanford university skill set underlying happiness, success, and overall well-being is not IQ? Research shows that emotional intelligence lead to benefits in a variety of life domains. 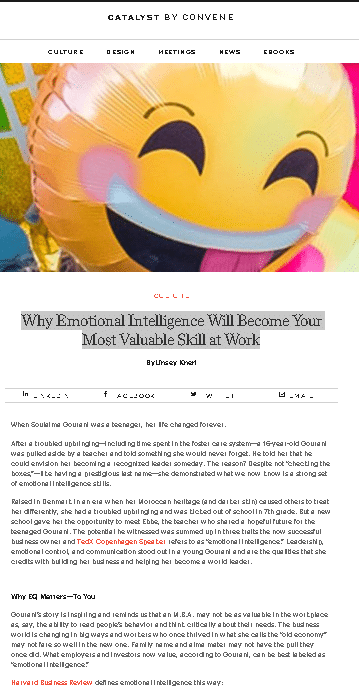 Emotional intelligence predicts professional success more than IQ or experience. In about 10 to 15 years the labour market will be radically different. We need to understand that the vast majority of us will lose our jobs. There will be new jobs. You just need to sit down and decide what you want to do. 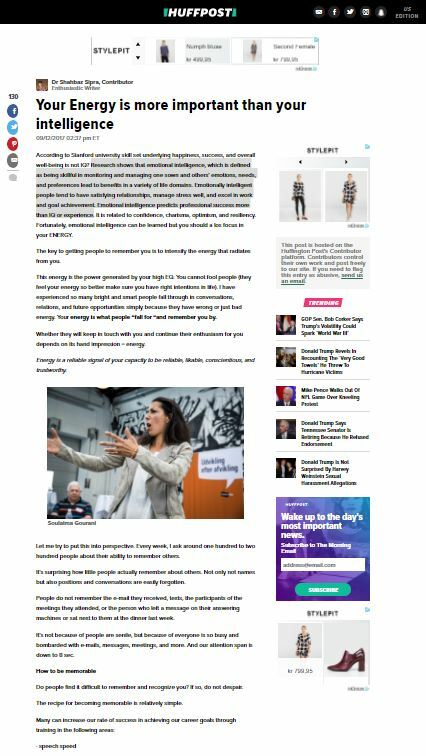 Millions of U.S dollars are wasted on “talent spotting” and “talent management.” We are wasting our energy on talents who are not really talents at all. And we overlook many who truly have a talent, just because we can’t SEE their talent. Interview: “Windy City Cosmo”, Windycitycosmo.com. 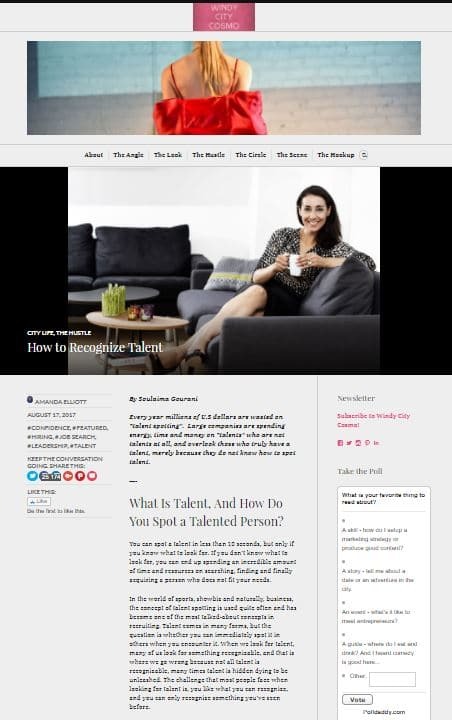 Every year millions of U.S dollars are wasted on “talent spotting”. 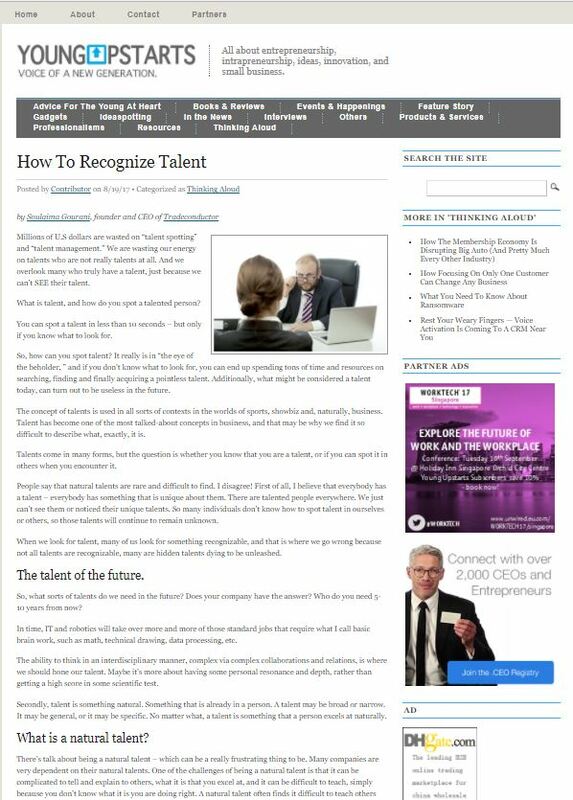 Large companies are spending energy, time and money on “talents” who are not talents at all, and overlook those who truly have a talent, merely because they do not know how to spot talent. EQ is key to achieving success in today’s workplace, says Soulaima Gourani. Take Control of Your Career is for the most part a compelling guide to a successful and improved working life as it embraces the unique power of EQ. 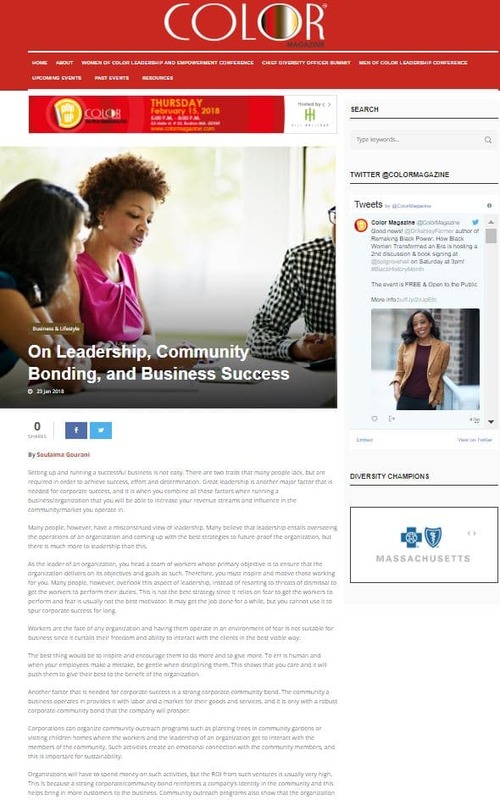 Professional appearance and executive presence in the workplace are important, but what makes you most valuable is your human ability to be creative and connect with others. 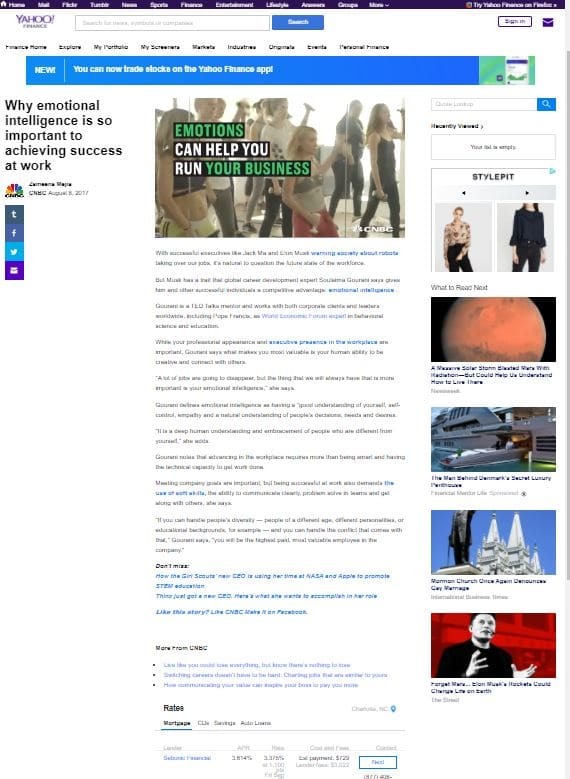 Interview:”CNBS – Make it!”, CNBC.com. 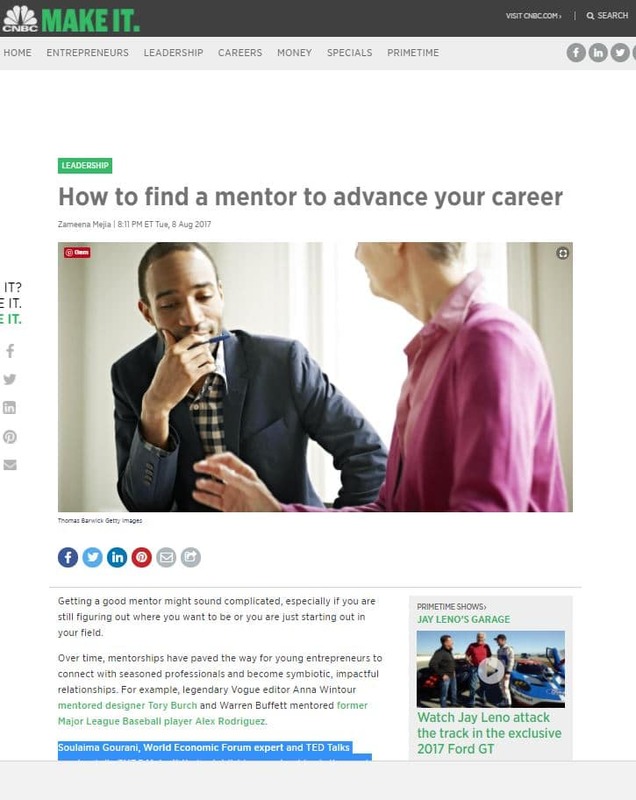 Soulaima Gourani, World Economic Forum expert and TED Talks mentor, tells CNBC Make It that establishing mentorships is the most efficient way to advance your career and personal growth. Our work will be changed within the next ten years. Are you ready or have you given up in advance? That question asks Soulaima Gourani and announces that the era of the nerds has come. Why you should walk the extra mile and update your skills during the holidays. 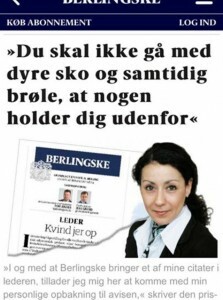 (In Danish). Soulaimas take on setting goals and growing a sustainable business while you think about your life and your career. 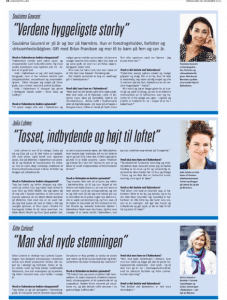 Interview with Soulaima Gourani “Berlingske, b.dk”. Soulaima Gourani’s life hasn’t always been easy. She believes that personal crises is an opportunity to grow. ‘Thinking back both negative and positive experiences have made an impact but also shaped me and my values in a good way’. 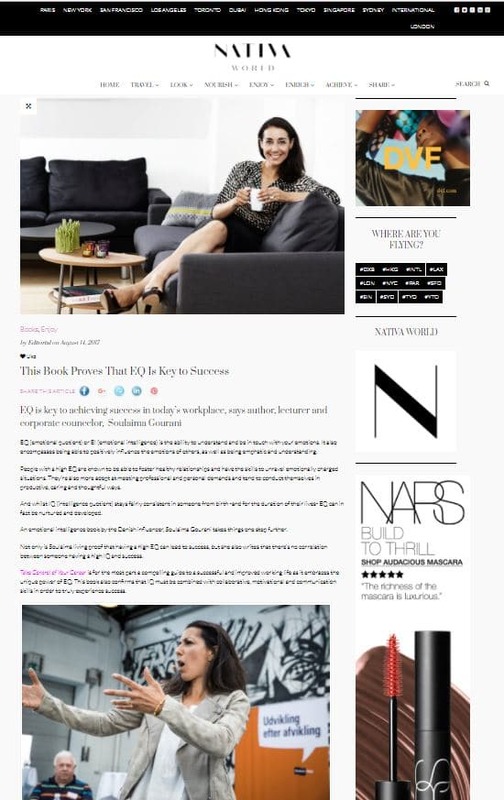 Interview with Soulaima Gourani “NativeAdvice, thenativesociety.com”. 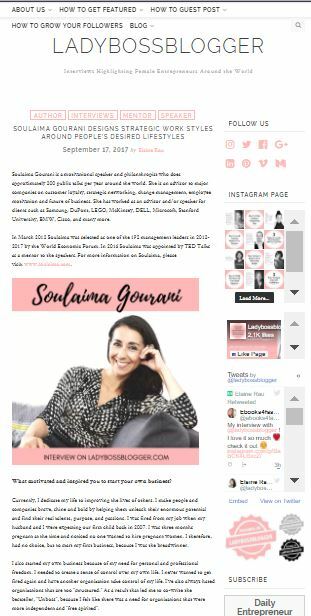 Soulaima Gourani tells the story of how she build her career and give advice to those working in her industry. 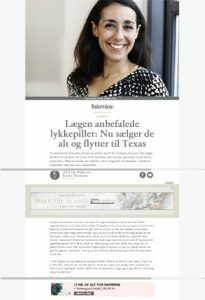 Interview with Soulaima Gourani “Dansk Industri, di.dk”. Soulaima Gourani tells about her biggest success, most challenging moments, rolemodels and passions. 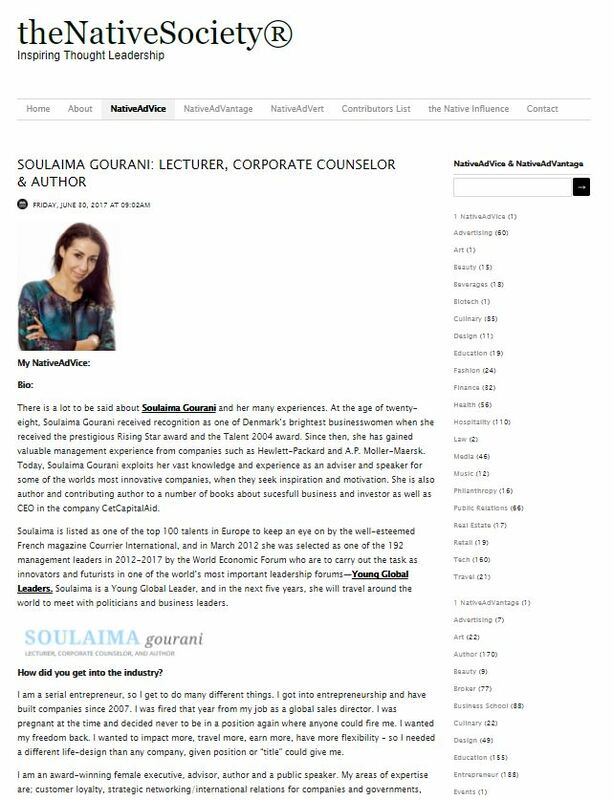 Soulaima Gourani talks about being a passionate entrepreneur. (In French). 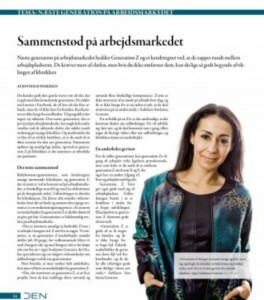 Soulaima Gourani about work life in Denmark and how you stay at the career track and still take maternaty leave. 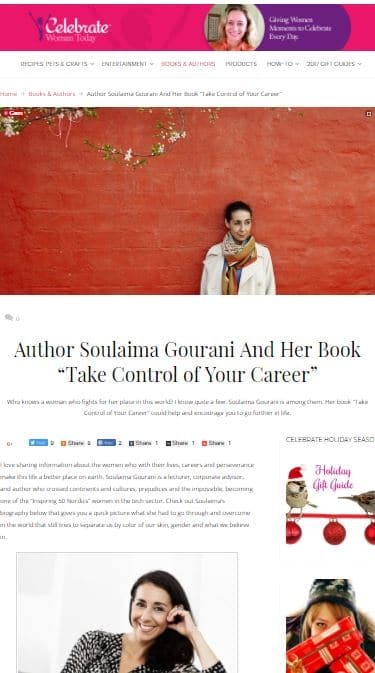 Soulaima Gourani talks about being ambitious , her career and designing the life you want. (In Danish). Soulaima Gourani talks about the biggest benefits of a remote workforce, how remote work is important to her business model and to her lifestyle. 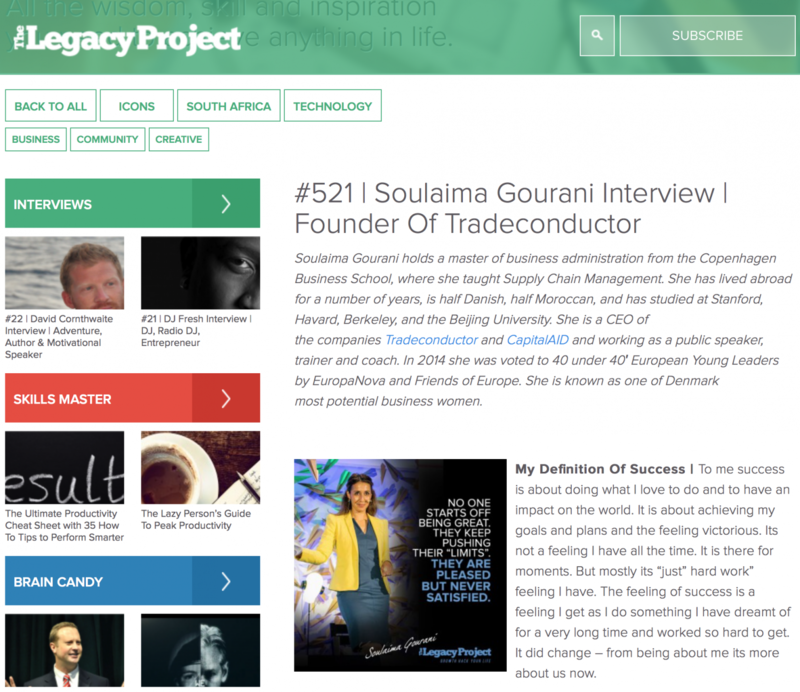 One of Europe’s Top 40 Under 40, working mom and entrepreneur – Soulaima tells her story. 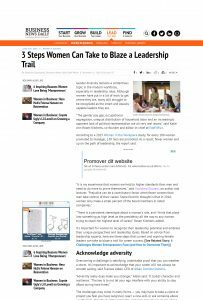 Soulaima Gourani talks about how gender diversity remains a contentious topic in the modern workforce, especially in leadership roles. 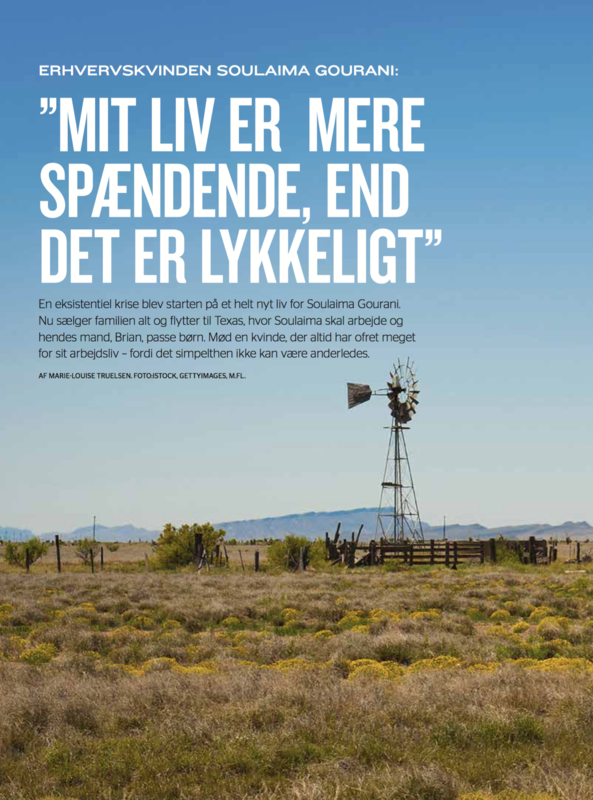 Interview with Soulaima Gourani “USA” in DANISH ISSUE Go Traveling 25. Soulaima Gourani moved to Austin with her family – without ever having visited the city. 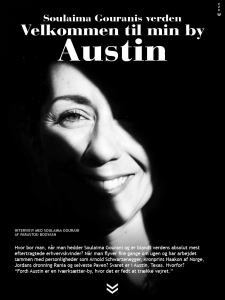 In the interview she tell us how it came about and what to do and see in Austin (In Danish only). 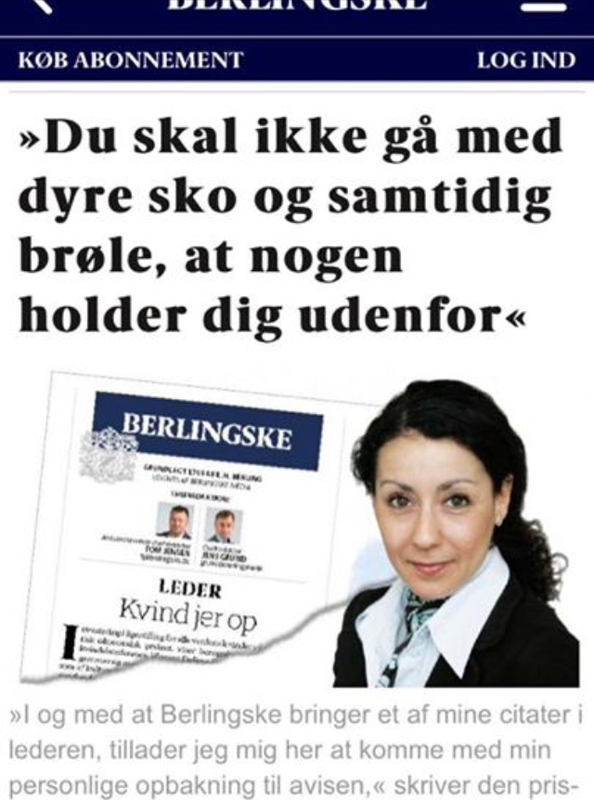 Danish newspaper Kristeligt Dagblad, Nov. 4. 2016. 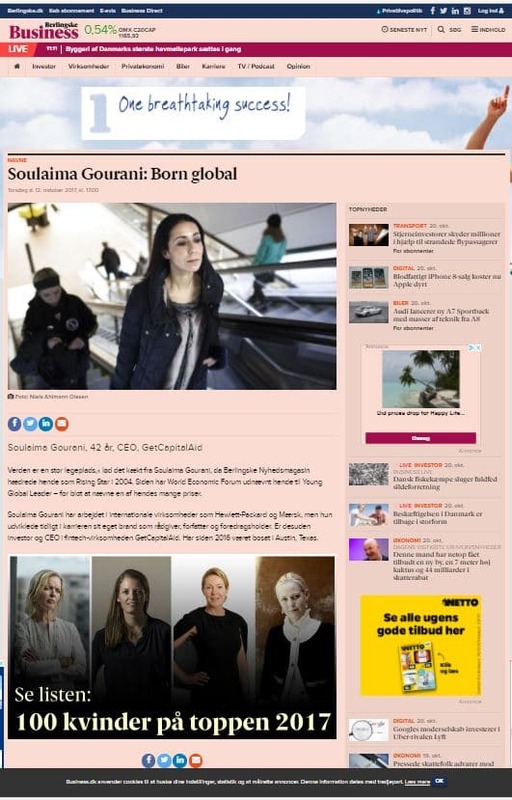 Interview in which Soulaima Gourani explains how she feels about belonging to the powerfull elite (In Danish only). Danish magazine Alt for Damerne 6/2016. 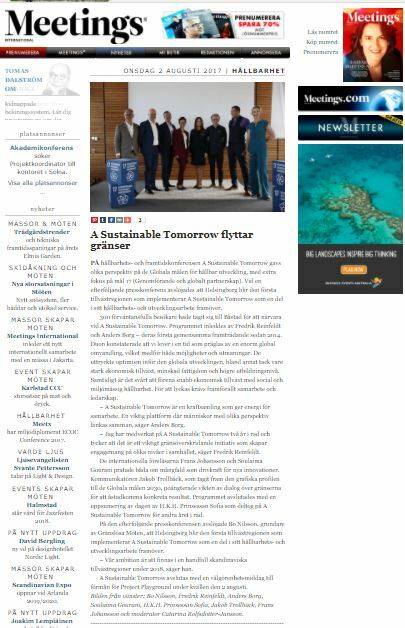 Danish Newspaper: Berlingske, May 22nd 2016. 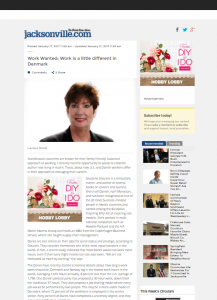 Soulaima gives her thoughts on women in business in this feature article. (In Danish only). “Everything has its own time. Everything sprouts, grows, withers, and disappears. This is the cycle of life – and the same process also applies to money and the way you obtain it”. 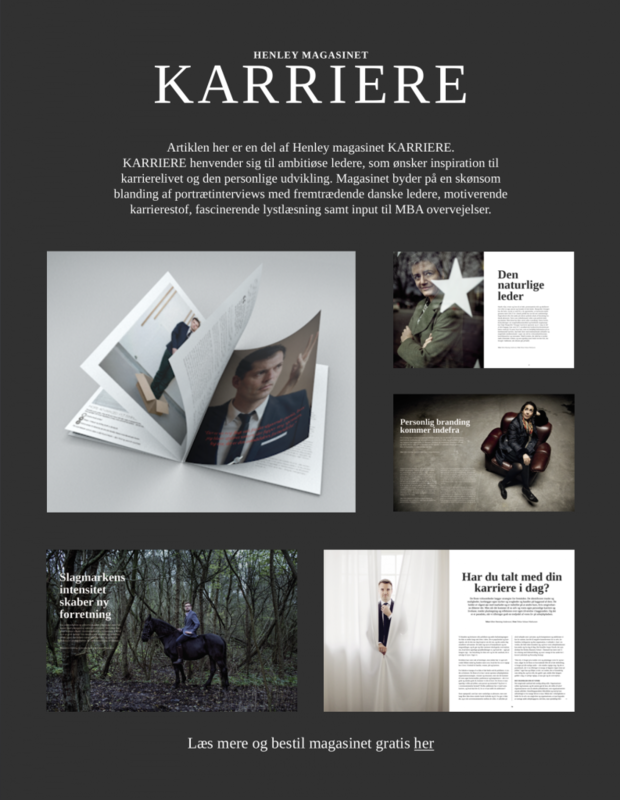 Danish magazine Alt for Damerne 2/2016. 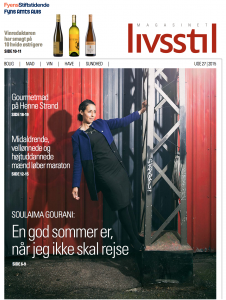 Interview in which Soulaima Gourani explains how she feels about work, family life and going through a life crisis (In Danish only). 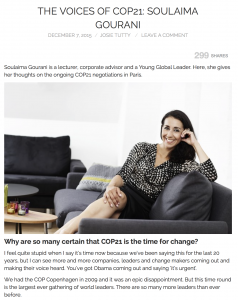 Soulaima Gouranis thoughts on the COP21. Article on the blog “Positive Luxury”. Article in Jyllands-Posten, Karriere, August 16. 2015. “Especially women turned their backs on me. 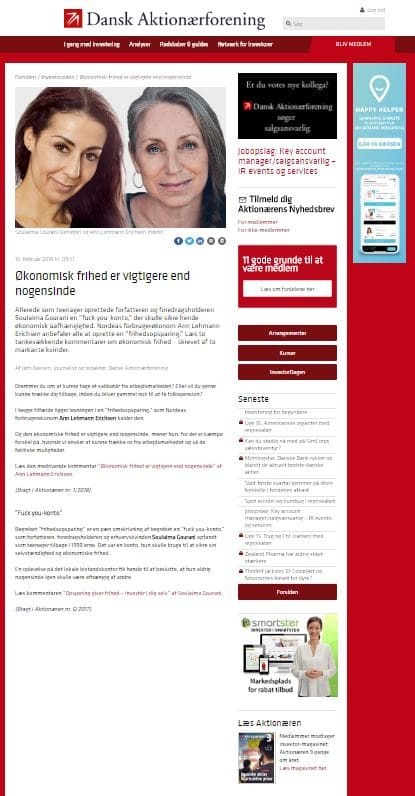 It became, “look at her she thinks she is something special”, and with my colleagues I went from being an ally to a direct opponent, she tells Jyllands-Posten”. In Danish only. 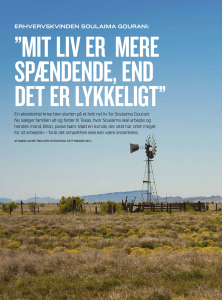 Article in Fyens Stiftidende, Magasinet Livsstil, week 27, 2015. Soulaima Gourani: “A good summer vacation to me is, one in which I don’t travel. Normally I am on the go 4 days a week, last month I went to 11 countries”. In Danish only. 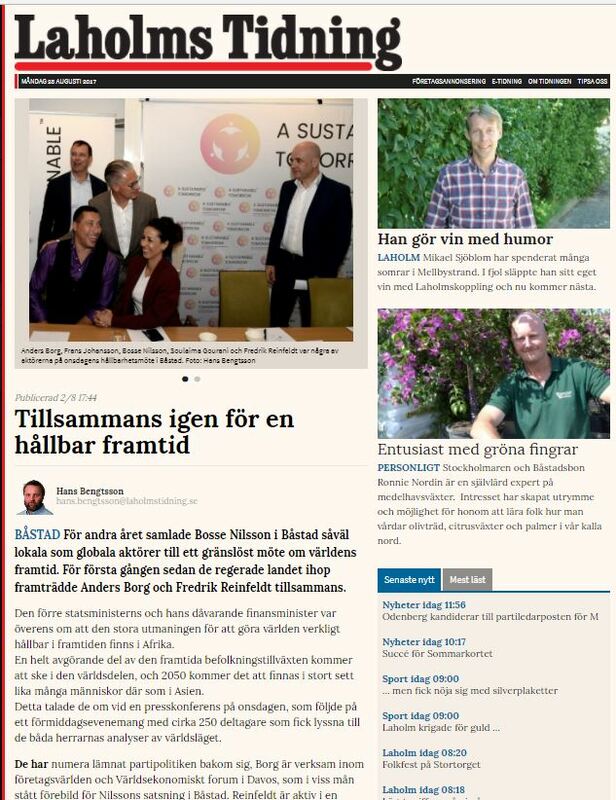 Article in Jyllands-Posten, Finans, May 22. 2015.“Do you think it is embarrassing that you earn less money than your colleagues? Or are you afraid to be the one earning the most? Well, then you are not the only one……” In Danish only. 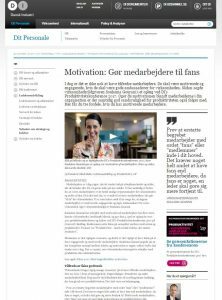 Article in TEMA, Danske Gymnasier (Danish upper secondary education) online magazine on the importance of not only using teachers in Danish upper secondary education, but bringing in scientists and business people to teach as well. In Danish only. 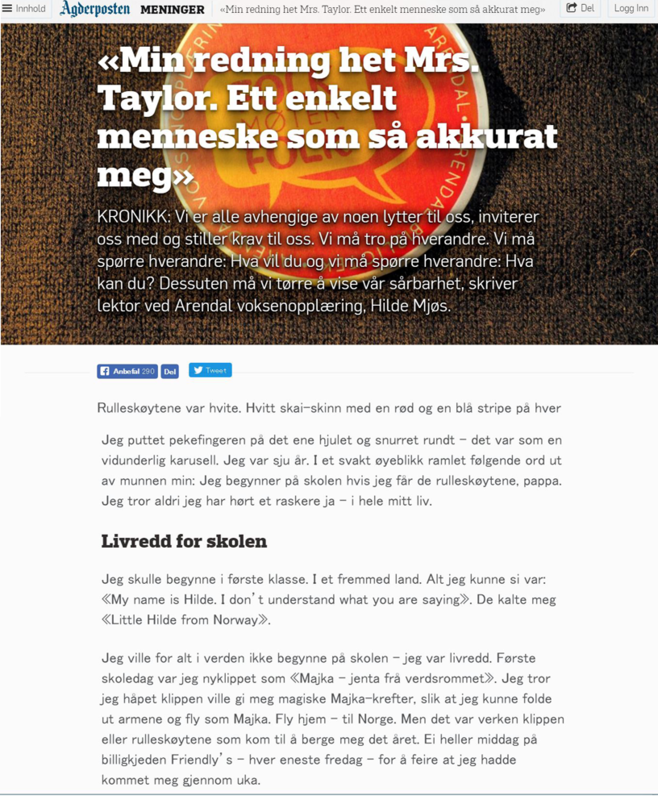 Article in the ad campaign “København” in Jyllands-Posten, November 28. 2014, p. 18. In Danish only. 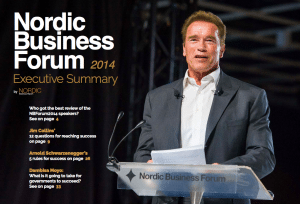 Article in Nordic Business Forum Executive Summary 2014, p. 38-42. Clashes on the labour market. Article in business magazine “Dental” September 2014, page 14-15. In Danish only. 38-year-old Soulaima Gourani’s sprint toward success is rooted in her courage. Courage to constantly dare to move out of the everyday safe environment, knowing that she is at risk of hitting her head against the wall. However, she always gets up after a fall – something she learned from his tough upbringing on Fyn, which she writes about in her new book “Courage to success”. Soulaima Gourani is a woman, who does not stand still for long. She lives in Denmark with her husband and two children, but in reality Denmark is too small and comfortable for her. Therefore, she travels all the time in the world to work and be inspired. 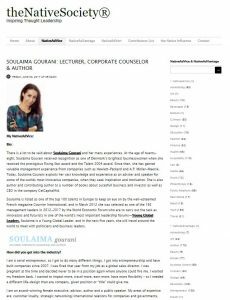 Soulaima Gourani is a sought-after consultant, speaker, author and board member of companies and NGOs. 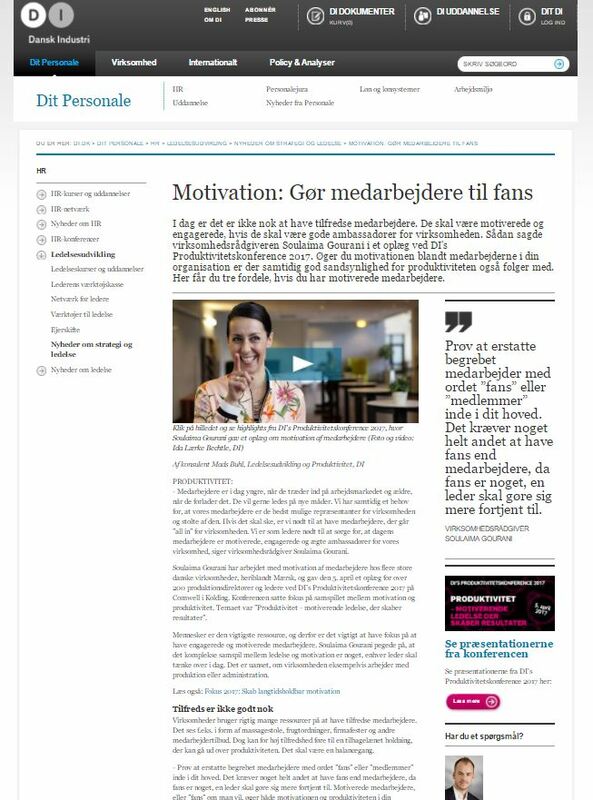 Read the interview conducted by Jyllands-Posten. ‘Who is she?’, was the overall reaction in the Danish Business Women Dubai board, as we at the end of 2013, gathered to make plans for the coming year. The issue came when we heard the name Soulaima Gourani. When we learnt more about Soulaima and her business we were very impressed. You can get an incompetent boss fired, but it’s an uphill battle, which requires alliances, strategy and courage. And despite the trial ends it is likely that you are the one, who gets fired. 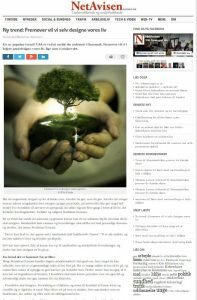 What is the biggest problem with equality in Denmark today? We ask three debaters where the next fight for equality is. “That women are not prepared to pay the same price as many men to powerful positions.” – Soulaima. 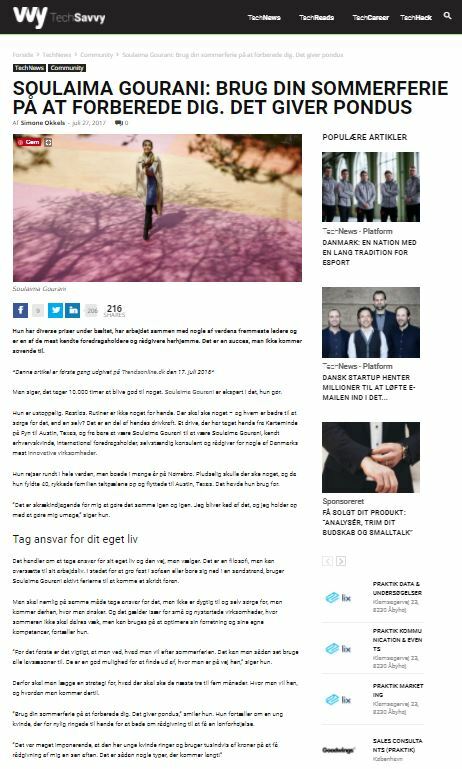 //The article is available in Danish. Am I a blue funk and a cheater? For Valentine’s Day 14:02 I wrote a debate post that should trigger a debate about modern love, career and gender roles. 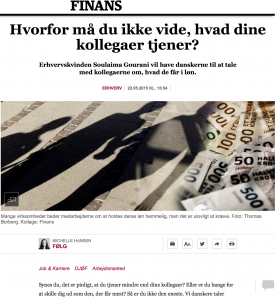 My essay was met with questions about where I had achieved my knowledge, of the two independent communication consultants (Jorgensen and Cheerful article in Berlingske 02/26/14). The debate quickly changed from being about the topic to be about me. Nobody will come to rescue you, so stop feeling sorry for yourself and do something. This is one of the topics in Soulaima Gourani’s new book, ‘Courage to success’. Had I known what I know now, I guess I had never dared to marry. My husband had probably never dared to flirt with me. Are you an ambitious woman, who strives to work 60 + hours a week, and want a management position with significant responsibility? Then be aware that you may have to pay a high social price. 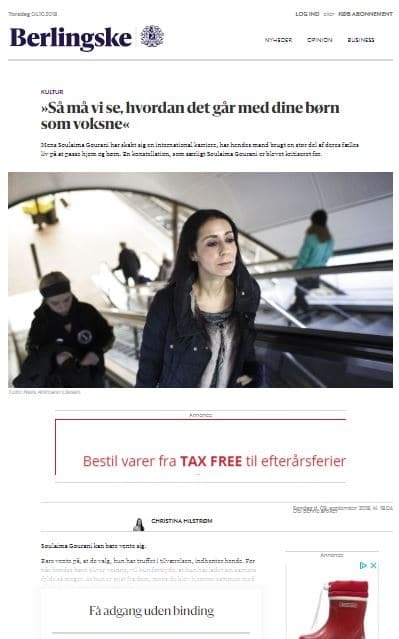 In 15 years, the Danish Foreign Minister may be Soulaima Gourani – a position she wants to achieve. In a new book she urges people to define a direction for their lives – and follow it. 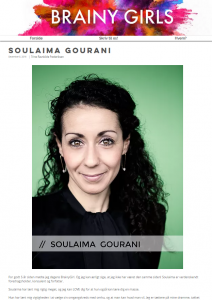 Soulaima Gourani has been voted to be among Europe’s 40 most influential leaders under 40. 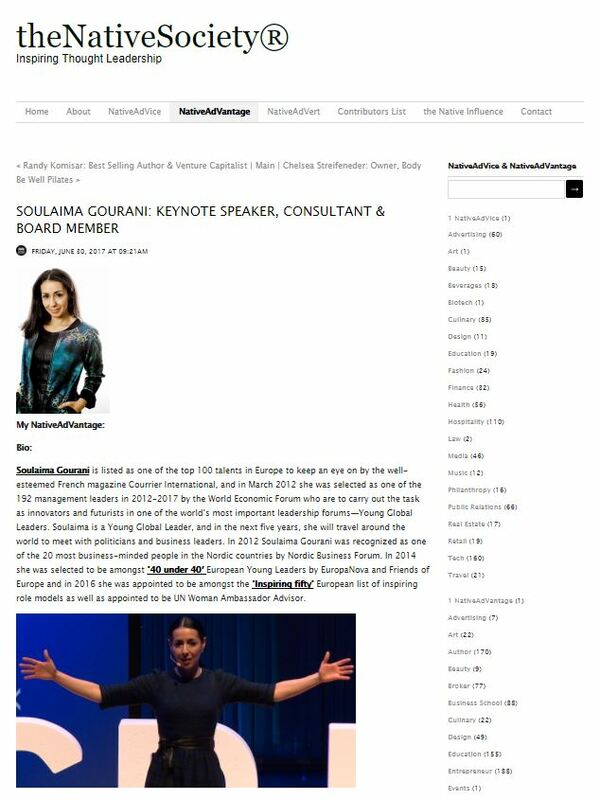 The selection of the ’40 under 40 ‘European Young Leaders have now been selected, where Soulaima Gourani has been voted to be among them. international appointment, thus becoming one of the most influential Europeans. You would think that people, especially well-educated and enlightened ones, are rational and know how to make good decisions. But no! Prejudice is human’s help to avoid ambiguity and making tough decisions. “We become dumber and lazier as the years go by.” This is the development, which Soulaima sees among the Danes, and this has to be addressed. 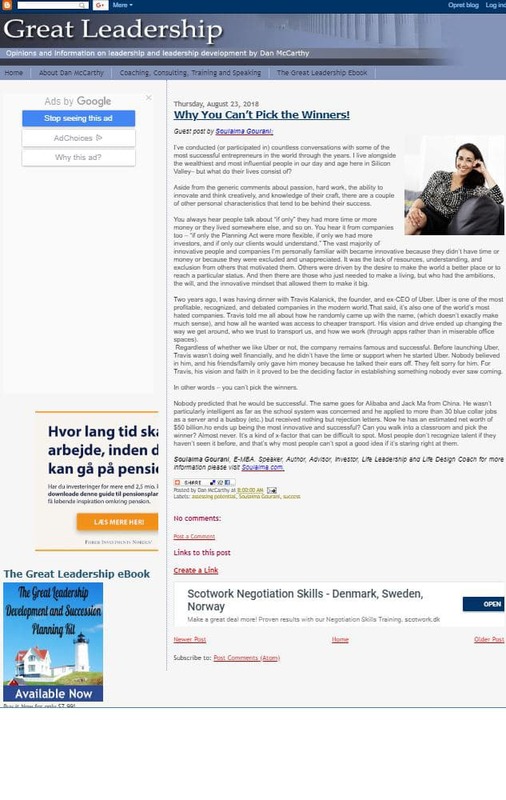 We Danes often repeat successes, but we must not be afraid of going new ways and thus sharpen our senses and change habits. In 2020, for the first time we will experience that we in Denmark have five generations in the labor market at the same time. This means that five different language will be spoken on different platforms with different skills. These five generations must be able to work together and develop businesses, but how do you get such work to get going? 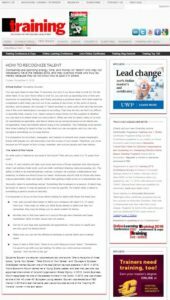 Soulaima Gourani will in this article give advices and thoughts on how future management should be handled. It is important to create and maintain networks, but how is it done? 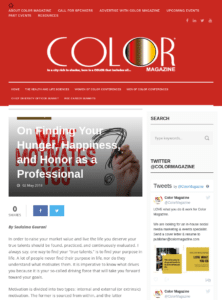 Soulaima Gourani will in this article tell you how to maintain it. 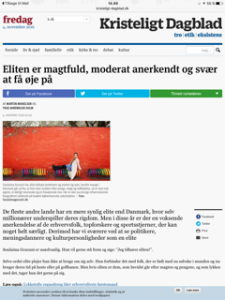 Foreign students are eligible to receive SU and the question is, whether the Danish education system can handle the pressure of the increased number of foreign students, who can get SU on equal terms with Danish students? Soulaima, together with Ole Christensen (MEP, S) Bendt Bendtsen (MEP, K), Mads Roervig (MF, V) and Mette Kim Bohnstedet (CBS and Harvard) will comment on this topic. 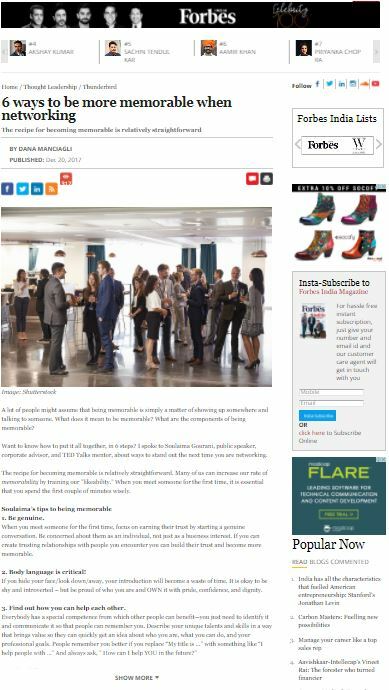 Want to become better at “networking” then read this article. Networking is not about knowing a lot of people but knowing the right ones. Soulaima gives her view on how to become a better networker, and succeed in strategic networking. 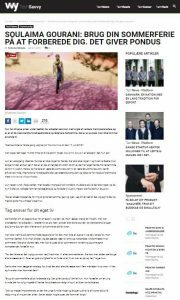 In this article by Alt For Damerne Soulaima Gourani gives her opinion on that we easily can do without things, we think is necessary in everyday life. She will, for example, avoid senseless shopping and online consumption. 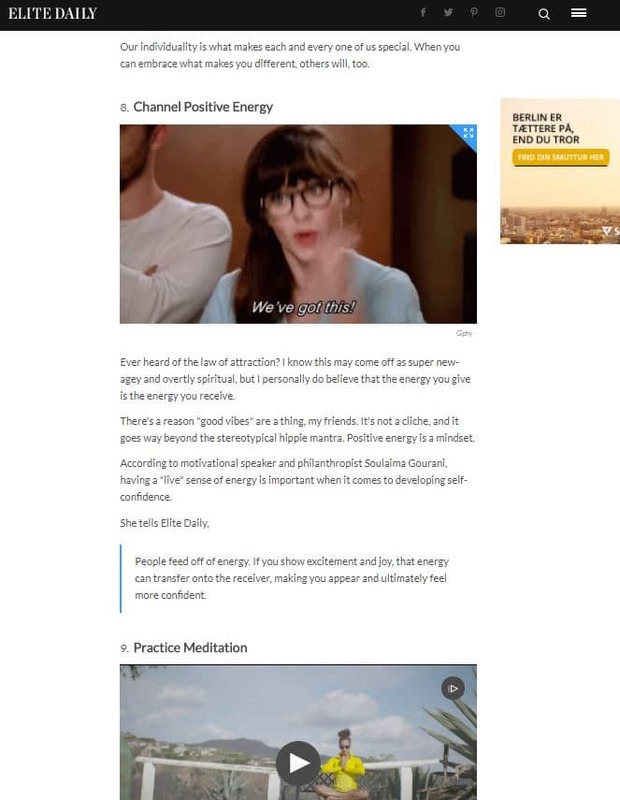 In this article by Samvirke, Soulaima Gourani will give you some good advice on how to strengthen your willpower in everyday life. In addition, she will tell you how she managed to quit smoking. 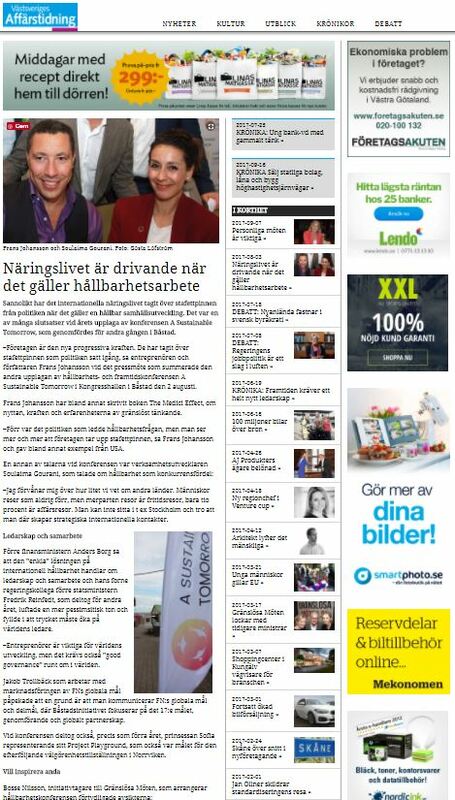 This article by Nordic Business Report is about Soulaima Gourani. 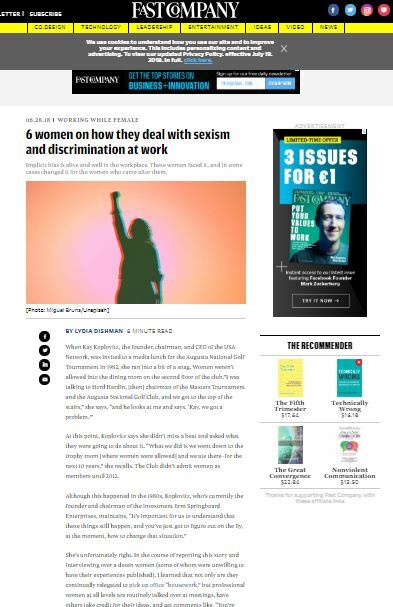 The article is written in context of that she has been elected to be one of the best female thinkers in the Nordic region. 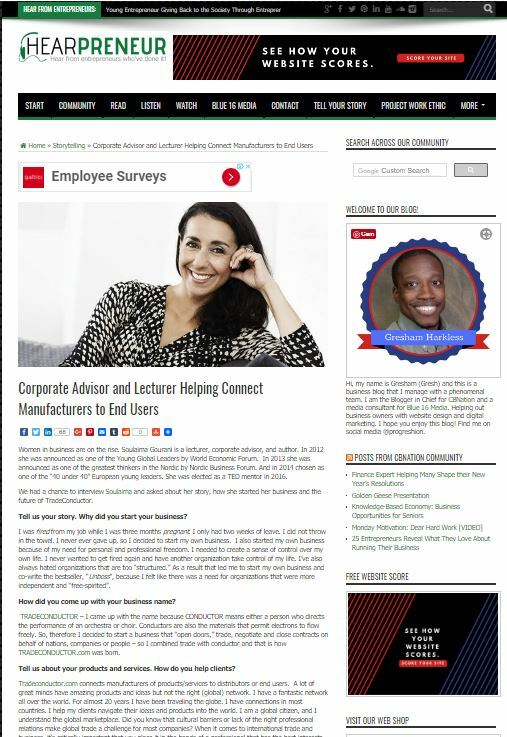 This article is an interview with Soulaima Gourani, in which she is asked what she believes the two main motivation resources, which management should focus on, is in the future to create employee satisfaction and hence bottom line. 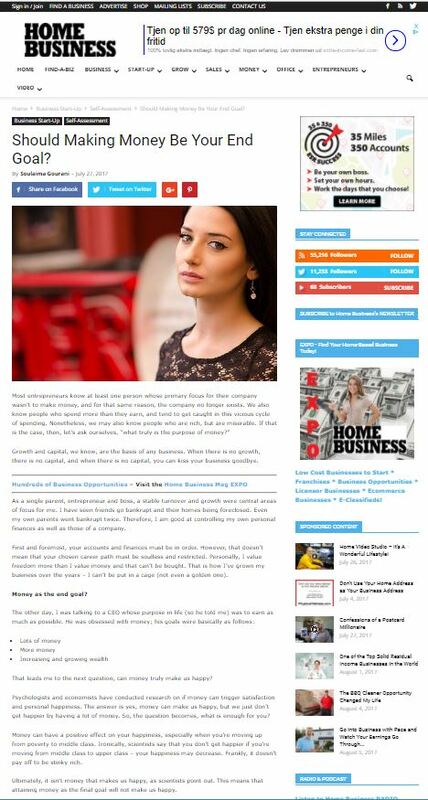 The article is about an interview with Soulaima, where questions about her motivation and purposefulness are asked. In addition, Soulaima is also asked about her title as provocateur, and whether she just provokes because she can? In this article by Soulaima Gourani, Soulaima talks about her grief of losing her father. 7 years ago Soulaima lost her father, and today she is still sorry that they never took the time talking about their problems. “We were often so angry and disappointed with each other. I should had known that it was because you and I are basically so sensitive.” The article is a love letter to her father, in which she tells him that although she sometimes feels alone without him, she still has her husband and two lovely children to feel safe at. 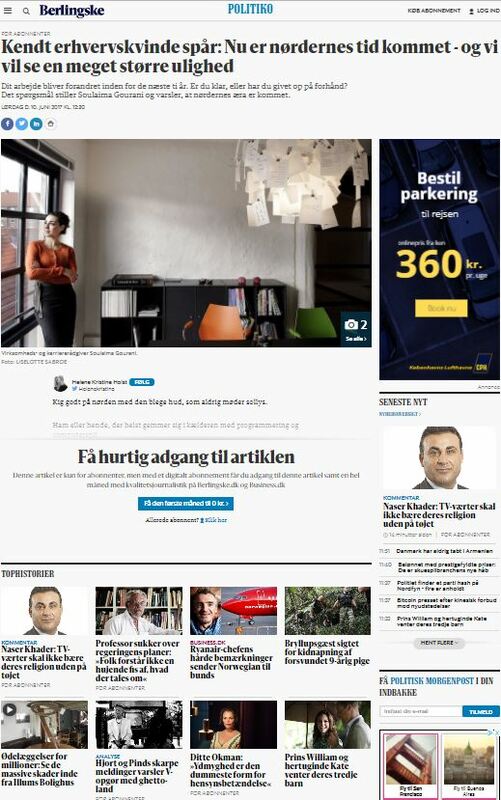 Four Danes has been named to be the most thoughtful people in the Nordic region, including Soulaima Gourani and Jørgen Mads Clausen. August the 16th, Soulaima has been chosen to be one of the 20 best thinkers in Scandinavia. “It’s so crazy, and I could not believe it when they contacted me. I thought it was a joke,” says Soulaima Gourani. 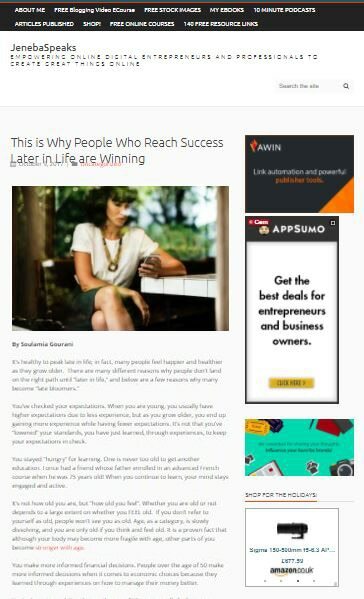 The article is about how Soulaima have ended up where she is today, and that she has proven that even if you are not born with a silver spoon in your mouth, the possibilities are still open. Soulaima Gourani is known for having inspired many people over the years. This article gives a firsthand story about a young man, Michael, who has been through many hard and difficult times in his childhood and teen years. Michael says that Soulaima was one of his role models that gave him motivation and purposefulness in life. 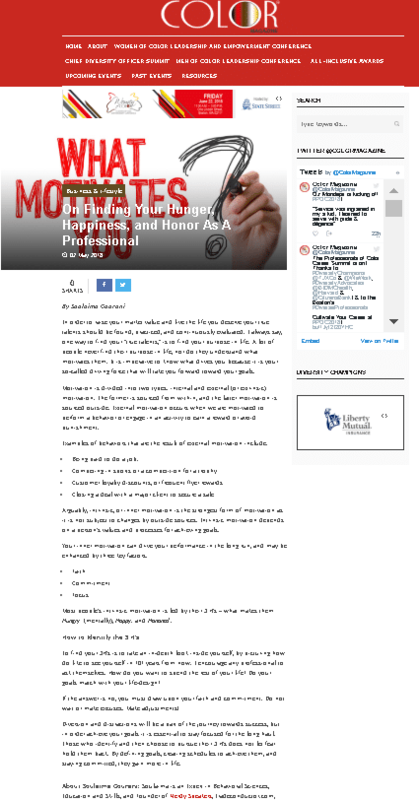 The author of this article has asked Soulaima what she sees as the two main-motivations, which management should focus on in the future to create employee wellbeing and hence bottom line. 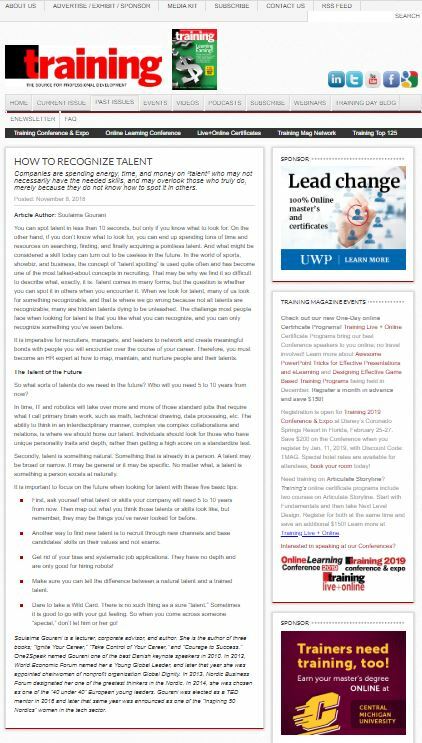 Read the article and learn more about Soulaima’s opinion on this, and discover which two main-motivation, which management actually should focus on. The article is about Soulaima, who she is and what she has been through in her youth. In addition, Soulaima also gives a tip; “Go-on-a-clothing-diet”. 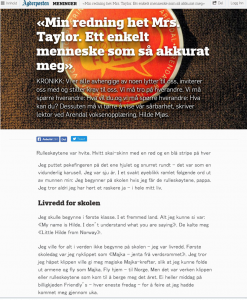 The article is in Danish. “Share your knowledge and you will become more knowledgeable”. 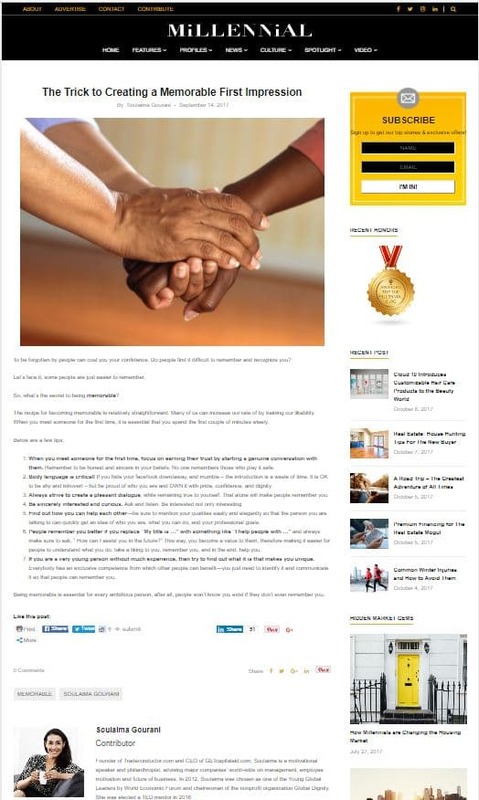 In this article by Soulaima, she says that we have to share our knowledge at work before it has any kind of value. We must be able to collaborate, to participate in complex contexts and additionally to posses professional competencies. Soulaima Gourani, 37, is a businesswoman, speaker, and author. She lives with her husband Brian and their children Storm and Pil. Soulaima lost her Moroccan father in 2006. An individual’s relationship with his/her father can have a great influence on his/her life. Read Soulaima Gourani’s touching declaration of love to the very first man in her life. Here in Denmark, we like the so-called “feedback burger,” where you start by saying something positive when you criticize, followed by the actual criticism/feedback, and finally, we wrap it all up with something positive! Why can’t we just say it like it is? It makes no sense to be oh so positive all the time, writes Soulaima Gourani. Soulaima Gourani takes advantage of her inner guide when she makes big and difficult decisions. And when she can’t feel what she thinks about a specific matter, she asks for time to think it over. The Government Summit in Dubai called for a ‘sustainable and inclusive’ development model, with international speakers commending the UAE for its success in fostering human resources development as a key priority. 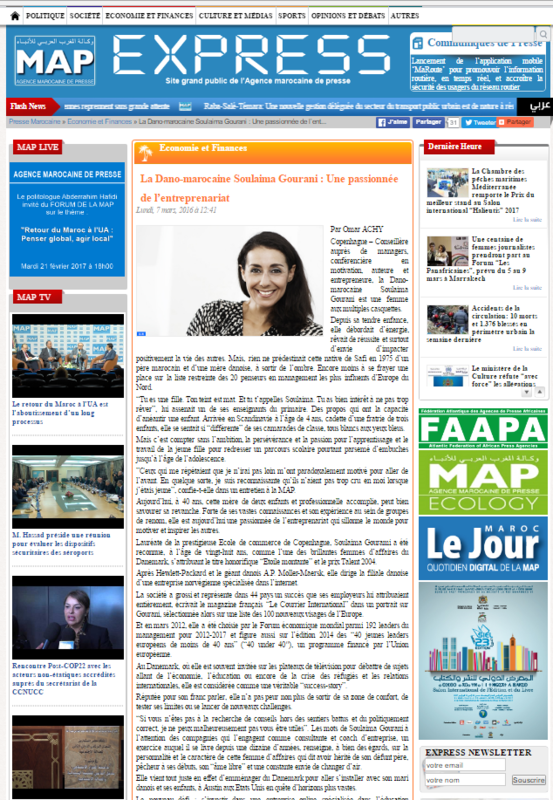 Soulaima Gourani is quoted for how to ensure a high level of future service in the public sector on the international side. 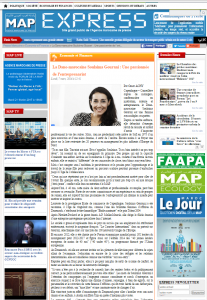 Soulaima Gourani was invited to The Government Summit for the United Arab Emirates i February 2013 to talk about the future of the serviceindustry and how to improve customer satisfaction. Here are the other speakers and people she will be discussin with. The boss’s role isn’t what it used to be. Actually, most employees prefer a boss who acts as a sparring partner. The classic manager role is becoming extinct, experts say, and in the future, managers should focus on delegating responsibility and showing trust. Businesspeople would like to know about art, and it is the job of the museums to make sure that they do, says the businesswoman Soulaima Gourani, who is involved in the project of merging the city’s three cultural institutions and sees that as a great opportunity for the city. The fusion board of directors behind the future super museum of visual arts advertises a post for the museum’s new director internationally. “If we are ambitious and want to make the institution known abroad, our new director needs to be internationally oriented,” says member of the board Soulaima Gourani, who has suggested an international candidate to the board of directors. Young girls need a push to give them more self-confidence to act and self-esteem to make the right choices. They must dare to dream and set ambitious goals. Global Dignity Girls is the name of the event that aims to help young girls become more ambitious. 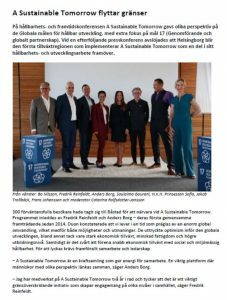 The event is sponsored by Soulaima Gourani, chairwoman of Global Dignity Denmark, who herself has taken the jump from a children’s home to becoming a well-known role model. Which countries do you think will become the winners in the future? Which type of employees do you think will we need tomorrow? I just came home from a trip to China, where they have decided to send 15,000 teachers out into the world to study which competences China’s school system must include to become competitive in the future. If we are to survive as a nation and be able to compete with, for example, Asia, we simply have to dare to be unrealistic and to dream, and each of us must travel more out into the world. The winners of tomorrow will be those companies with a strategy for really understanding how to adjust their organizations for the young people in such a way that both structure and behavior match their attitude toward work, life, and career. According to adviser Soulaima Gourani, the most important questions that business leaders have to ask are these: How do we attract young people below 25 years old? How do we retain them? How do we motivate them? Generation Z people, who are between ages 15 and 25, are the digital natives. Today, more or less every 10th employee is a digital native, and in the next 5 years, this share will double. In 10 years, every third employee will be a digital native. Companies must have a strategy for how to attract, retain, and communicate with the digital natives if they want to be in existence in the next 20 years. How many clothes does a woman need? In the wake of the financial crisis, Danes buy fewer pieces of clothing of better quality. Soulaima Gourani is one of them. She has started on a very strict “clothing diet” and now only owns 36 pieces of clothing. Read her explanation here. A network is one of the most important things you can have, whether you are a wage earner, unemployed, or self-employed. The message is clear and comes from speaker, author, and one of the country’s leading businesswomen Soulaima Gourani. We met her for a talk about networking. Soulaima Gourani has decided to challenge herself—in a place where only a few women want to be challenged—in the wardrobe. She has gone on a clothing diet. 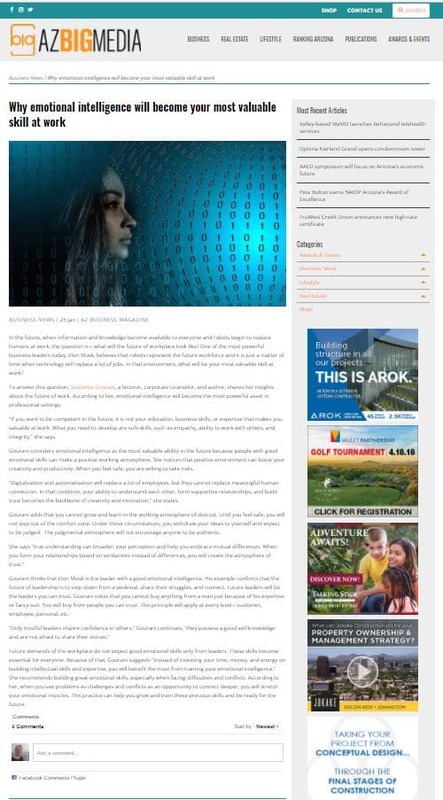 A little piece about why IT and media are important in the schools and day care offers kick-started with a talk by Soulaima Gourani—in conclusion, some observations on competence development based on desire and joy. Imagine that! Learn what you should talk about if you want people to remember you when you attend an event. And no, people do not want to talk about the weather.